Sometimes, you get a rare opportunity to do things differently. That’s how StrataPointe came to life. A uniquely urban gated community bringing new, modern style to Buena Park. 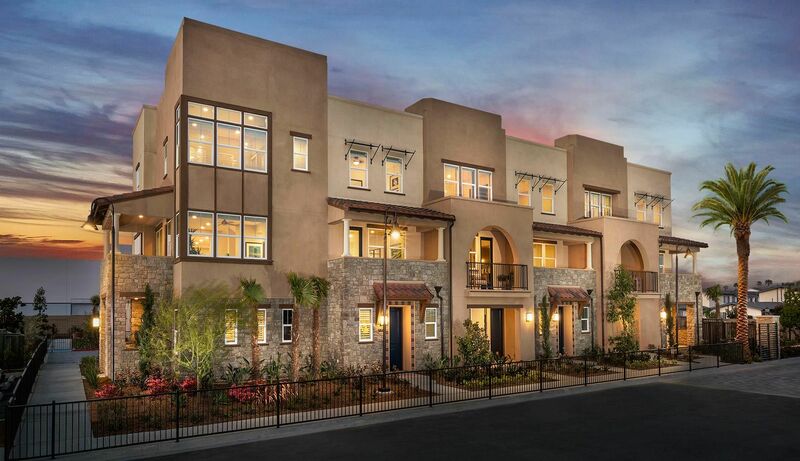 Three-story townhomes are your headquarters for life in the vibrant center of the Southland. Freeway adjacent and convenient like crazy—to schools, shopping, dining, and entertainment—StrataPointe lives large. You’ll find 2- to 4-bedroom homes with 2.5 to 4 baths, 2-car garages with interior access and decks for sipping morning coffee or grilling tonight’s dinner. A downstairs den with a full bath in select residences is ready to style as a guest retreat for visiting friends and family or as a high-tech office space where you work it. #LikeABoss. Thoughtful design makes the homes airy and light. Community amenities, including a umbrella-rimmed pool and spa plus barbecues and a children’s play area, mean you can chill out and play like you’re at a resort one minute, and the next be headed down the street to catch a movie or shopping at The Source. It’s the best of all worlds, ready to make your own, from the low $500,000s to mid $700,000s.